Have you ever wanted to be the President of the United States? It is a thought that many of us have had from time to time and one that, certainly, our parents have considered for us as they proclaim that we had the ability to become anything that we set our minds towards. The Presidency seems to always be that highest pinnacle, the crowning achievement. Then again, some can look at high public offices and wince a bit, pointing at a number that have left a number of us wanting and a few others aghast as we’re trying to figure how they managed any votes! And, even if you think you can handle the job, campaigning is such a pain in the rear. But, there are much easier ways to become the President without having to run around the whole country, talking yourself up and kissing every baby until you’ve managed to win enough votes—and we’re not talking about voter fraud, either! 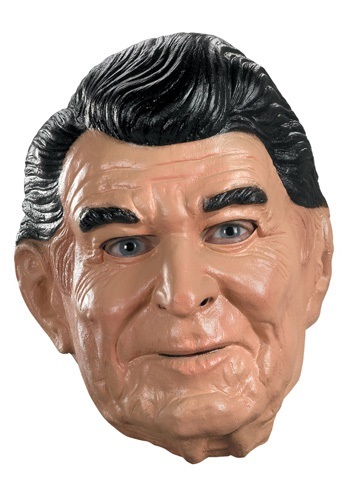 You can just transform yourself into a President that everyone already recognizes with this Ronald Reagan mask. Transmogrify with this full molded latex mask and get ready to yell “Reagan Smash!” as you topple your opponents as one of the most heavy hitting Presidents of them all. But, a warning: remember that Reagan masks usually have a different meaning when you go to banks, so we don’t recommend that.